Two weeks ago, we published a new map of the Earth at night, built by Earth Observatory designers together with colleagues at the National Geophysical Data Center. That mapâ€”made possible by a new NASA and the National Oceanic and Atmospheric Administration (NOAA) satelliteâ€”showed the footprint of human civilization on the planet, as revealed by the lights we use to brighten the darkness. 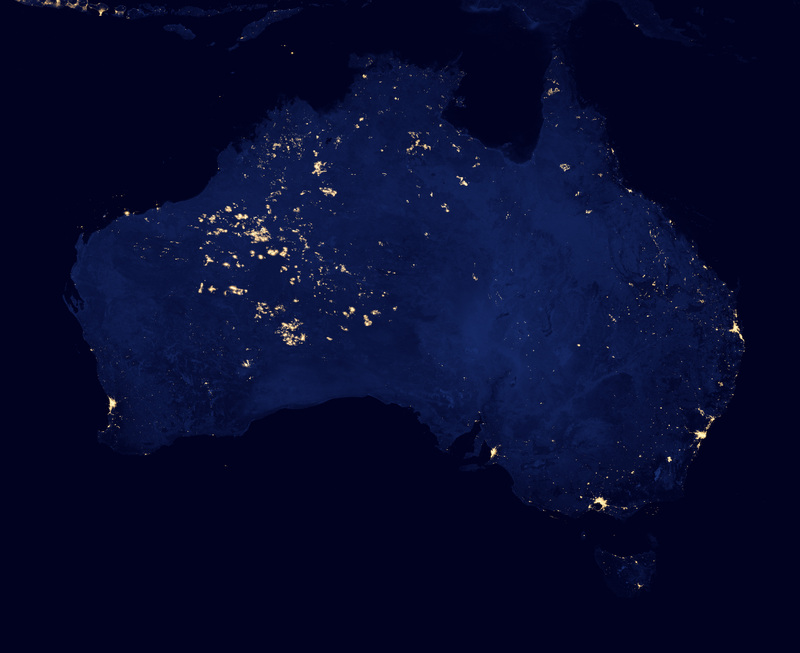 The top image above shows the night lights of Australia as observed by the Visible Infrared Imaging Radiometer Suite (VIIRS) on the Suomi NPP satellite in April and October 2012. The composite image includes manmade light sources and the light of wildfires. The data were acquired over nine days in April 2012 and thirteen days in October 2012, and it took the satellite 312 orbits and 2.5 terabytes of data to get a clear shot of every parcel of Earthâ€™s land surface. The second map is a mosaic showing the burned areas of the landscape (red) from October 11â€“24, 2012, combined with urban areas (black). The data were collected by the Moderate Resolution Imaging Spectroradiometer (MODIS) instruments on NASAâ€™s Terra and Aqua satellites. In effect, the map shows where fires burned that month. 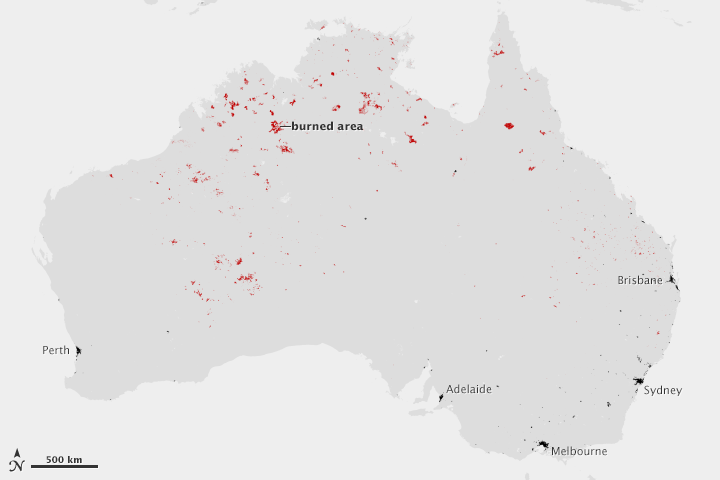 Though many rural areas of interior Australia are dry and relatively barren by some standards, there is still enough vegetation to burn, as you can see by clicking on this view from the International Space Station and others from the MODIS instruments. 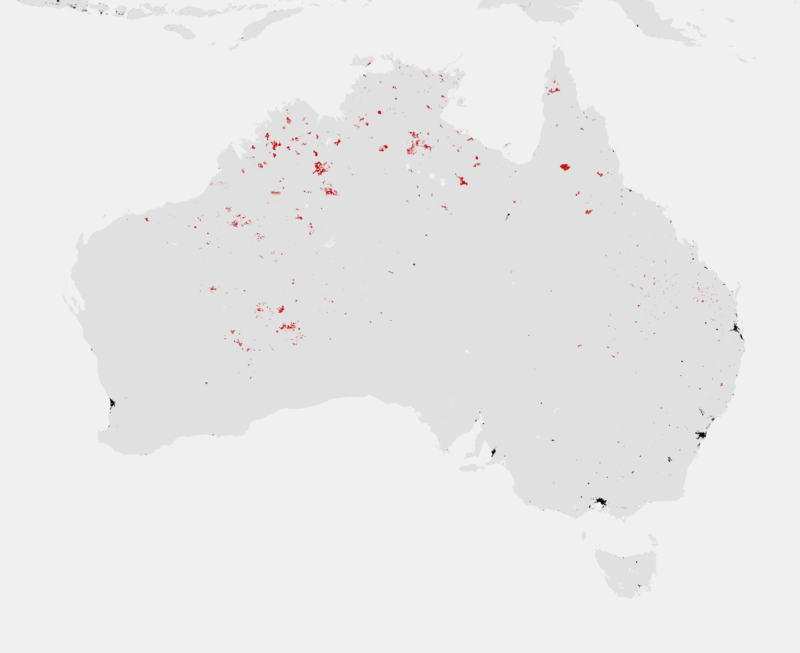 The extent of the lighting in the Outback and bush country is a function of composite imaging. Fires and other lights that were detected on one day were integrated into the composite, multi-day picture despite being temporary phenomena. Because different lands burned at different times that the satellite passed over, the cumulative result is the appearance of a massive blaze. But while the cities are fixed, the fires were temporary, moveable features. The night lights data set is a scientific work in progress, and the maps will be refined and improved over time. Not every light in the night view matches up with a fireâ€”partly because the fire map does not include fires from April and partly because not every fire leaves a scar that is detectable from space. Even simple cloud cover could prevent burn scars from being observed. 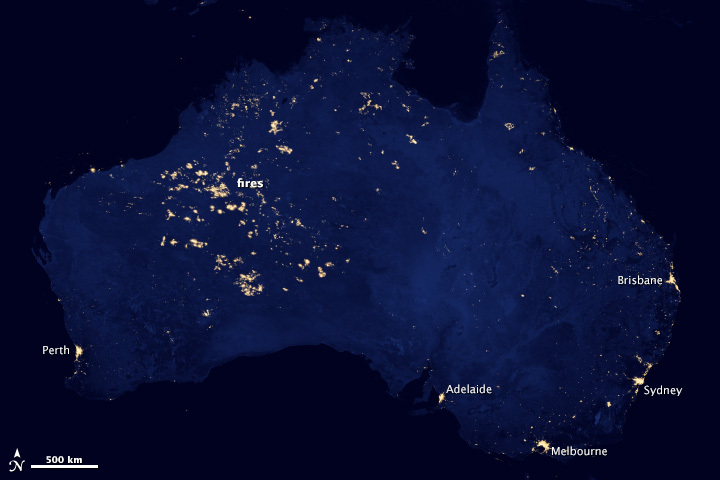 Aside from the fires, some of the night lights appearing in uninhabited areas can be attributed to natural gas flares, lightning, oil drilling or mining operations, and fishing boatsâ€”all of which can show up as points of light. One example is natural gas drilling in the Bakken Formation in North Dakota; another is the fishing boats plying the seas of Asia. 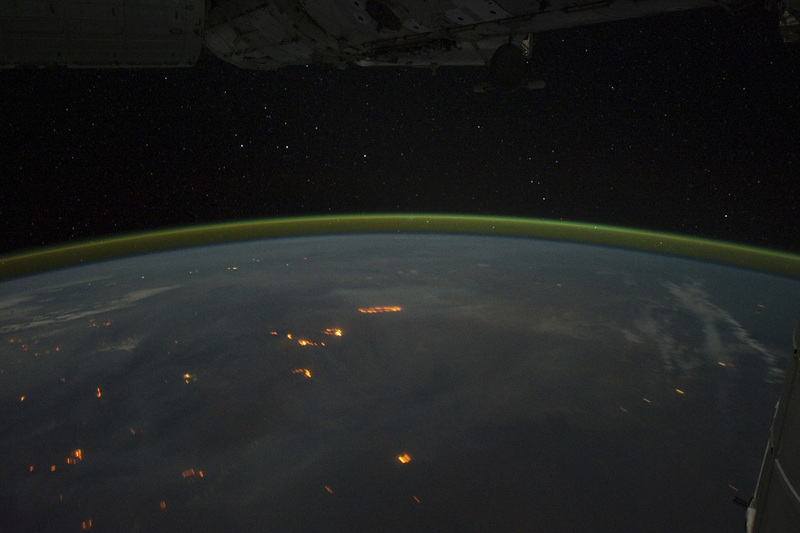 And ultimately, the new images of Earth at night are ripe for new discoveries. Itâ€™s easy to say that lands are uninhabited or barrenâ€”that thereâ€™s nothing out there to make light. But the satellite says there is light, so we should probably go take a look at what we have been overlooking or simply could not see before.